So it's our final review of 2014 - appropriately enough, it's a guy who'd be obsessed with Janus. Batman: the Animated Series did what no other Batman media has managed to do before (and yes, we're even including the comics in that one): it made Harvey Dent a part of the story in advance of him becoming Two-Face. Yes, Tim Burton tried to do it, by casting Billy Dee Williams as the District Attorney, but that acid must have been pretty strong if it burned him into looking like Tommy Lee Jones. On the other hand, the cartoon introduced Dent in the first episode, gave him plotlines of his own to deal with, and didn't even hint at Two-Face until three weeks in (which doesn't sound like much, but remember that BtAS was airing at least five days a week at that point, so it was the 17th episode to be shown). We had time to get to know Harvey and care about him, so when he became Two-Face, it mattered to viewers just as much as it mattered to Bruce Wayne. When he first appeared in the 40s, Two-Face's scarred side was green. When he was brought back in the 70s, it was more purpley, and that (or red) is the way it's been since. That was too gruesome for the animated series, so it went with blue. To truly be show-accurate, the black of his eyebrow should come all the way down to his oversized eye - we must be intended to view him from above, not head-on. Nice work on his wild cowlick, we must say. Two-Face is just wearing a plain suit - it wasn't until The Dark Knight that making half his suit be burned and tattered really became a thing. Not that the cartoon would have animated anything that complex, but you get the idea. Anyway, this is just a plain suit, so get ready to see it crop up in all the "civilian" customs people make next year. It is a nice sculpt, though: it really captures the series' smooth, clean lines. What's really impressive are the two faint indentations right by his waist: at first, they look like the twist-tie holding him in the tray was too tight, and scarred the plastic; but your mind will be blown when you realize they're actually an indication of his pockets! 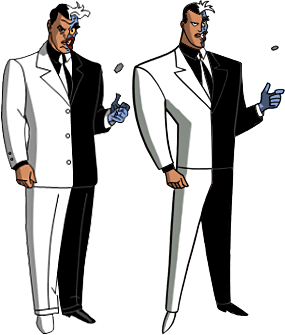 Harvey didn't really get changed when the show's characters were redesigned: in the original art, he wore a white and black suit, and had a blue scarred face; after the redesign, he wore a white and black suit, and had a blue scarred face; the only thing different was the way it was drawn, which isn't really something you can say for any of the other characters. 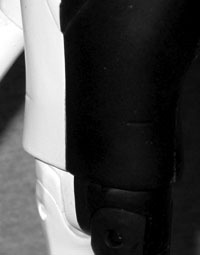 This toy gets things right (duh), painting half his suit white and half black. There's even a line down the center of his back where they join, which is actually pretty clever - what's more likely, that he dyed half his clothes, or that he just took two suits, cut them in half, and sewed them together? In all the reports of broken joints (which, for the record, is what really kept BtAS from winning "Best Line" in this year's ToY Awards), Two-Face seems to have the fewest problems. He has swivel ankles, hinged knees, H-hips, a waist, swivel wrists, swivel/hinge elbows and shoulders, and a balljointed head. So that his suit jacket doesn't block the arms too badly, it's made of soft PVC over the torso beneath. 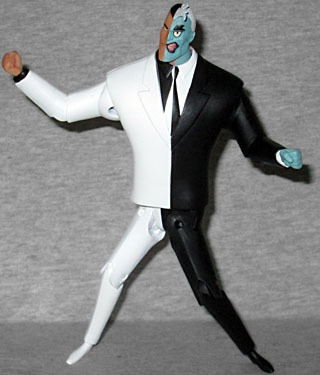 Like Batman, Two-Face comes with a doll stand to help keep him upright - what works in a drawing doesn't always work in real life, and there's no way a Bruce Timm character would ever be able to stand on those itsy-bitsy little feet of theirs for very long. 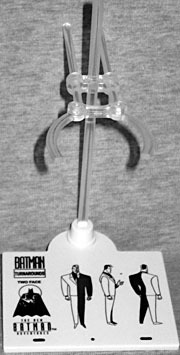 The base is still printed with the model sheet turnarounds of the character (thus allowing you to easily identify which base goes with which toy), but the clear plastic arm is a slightly different style: in addition to moving up and down on the post, the clamp is also designed to be positioned as far forward or back as you like. This will come in handy when we get to some of the smaller characters! It's hard to find a spot around his torso where the clamp really holds firmly, though. Two-Face is just as heavy on the accessories as Batman was. 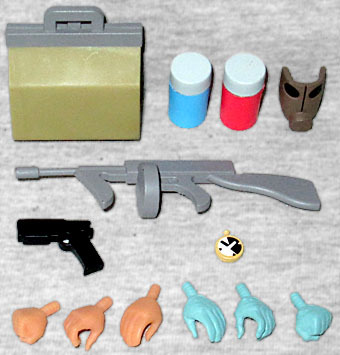 He has three sets of hands (fist, casual, trigger finger), a pistol, a machine gun, a watch, a red canister, a blue canister, a large brown valise, and a gas mask. All these accessories come from the Season 4 episode "Sins of the Father," which also introduced Tim Drake. The two jars are part of a binary-liquid gas device that Two-Face plans to set off at 2am unless Gotham City pays him $2 million dollars - that also explains the watch (he's checking the time) and the gas mask (which really does fit on the figure's face, and stays on using nothing but friction). The bag actually opens, and is large enough to hold both jars comfortably. Excellent! The only thing that seems to be missing is Two-Face's trademark coin, but it's right there, sculpted into the palm of his relaxed right hand. Shame they couldn't have repeated what worked for the Long Halloween Two-Face and give us two different hands showing different faces of the coin. Other than that one "what if," this is a nice figure. He's not as good as Batman, but then, that's a high bar to reach for. It definitely helps that I was able to open him without any joints breaking.